The Lyrid meteor shower peaks overnight on April 22-23. 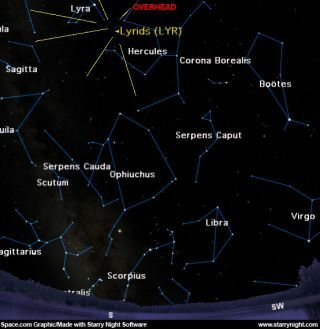 This sky shows the location of the Lyrids center seen at 4:30 a.m. from mid-northern latitudes. One of the "Old Faithful" of the annual meteor showers will be reaching its peak this week: the April Lyrids. Unfortunately, this year the moon is going to interfere with getting a good view of these celestial streakers. The April shooting star display will hit its peak on Friday night (April 22) and during the early hours of Saturday. During that time, as many as 15 to 20 meteors per hour might be seen by a single observer under dark, clear skies. The paths of these meteors, if extended backward toward their apparent origin point in the sky, seem to diverge from a spot in the sky about 7 degrees southwest (to the lower right) of the brilliant blue-white star Vega in the little constellation of Lyra (hence the name "Lyrids"). Your clenched fist held at arm's length measures roughly 10 degrees in width. To be precise, the Lyrid meteor shower's center, called the radiant point, is on the border between Lyra and the adjacent dim, sprawling constellation Hercules. While hardly a rich display like the August Perseids or December Geminids showers, the April Lyrids have been described as "brilliant and fairly fast." They also tend to leave a shining trail behind it for a few moments. Unfortunately, as we alluded to at the onset, this year the moon is going to be a problem for prospective meteor watchers. It will be in its waning gibbous phase, approximately 68 percent illuminated and rising around 1 a.m. local daylight time on Saturday morning and thus will spoil the whole "morning end of the night" and shining not very far southward from Lyra in the sky. So moonlight is likely to squelch all but the brightest Lyrid streaks. Your best chance of seeing any will come in the hour just before dawn breaks: 3:30 to 4:30 a.m. local daylight time. That will also be about the time that the Lyrid radiant – where the meteors will appear to diverge – will be almost directly overhead from the southern United States, and not far off it for anyone in the mid-northern hemisphere. The orbit of the material that creates the Lyrids strongly resembles that of Thatcher's Comet, which swung by Earth during the spring of 1861 and has an orbital period of approximately 415 years. In 1867, astronomer Johann Gottfried Galle confirmed the link between this comet and the Lyrids. So the meteors that we see from this display are the tiny particles that were shed by Thatcher's Comet during its previous visits through the inner solar system. There are a number of historic records of meteor displays believed to be Lyrids, notably in 687 B.C. and 15 B.C. in China, and A.D. 1136 in Korea when "many stars flew from the northeast." In 1922, an unexpected Lyrid hourly rate of 96 was recorded and in 1982 several observers in Florida and Colorado noted rates of 90 to 100 on April 22 of that year. As British meteor expert Alastair McBeath writes in the 2011 Astronomical Calendar, "Lyrids give no clues as to when another such outburst might happen, hence the shower is always one to watch." So if the skies are clear early Saturday before sunrise, and if you're in a sporting mood, why not head outside and try to catch a few "falling stars?"